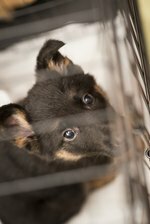 Training your puppy to stop whining at night in the crate should be an easy task if you are willing to adhere to a schedule. It may take some time, the amount of time depending on the individual puppy. Some puppies will stop whining right away, while others will need more time. Be patient with your young puppy, and remember to never scold your puppy for whining, as that will only have negative affects. Treat your puppy kindly, and as soon as a routine is established you will be amazed at how quickly they can learn. Take your puppy out for a pre-bedtime walk. Make sure it is a long walk, and give your puppy some running around playtime. This will help him use the bathroom outside, and will also help in tiring him out for the night. Like young children, they need to use the bathroom more frequently, as they cannot hold it. They also tire quickly, and require more sleep than adult dogs. Put a soft and comfortable dog bed in his crate. His crate should be an inviting place and a safe haven for him. An old blanket will do as well, but remember that puppies will chew and may become anxious during long nights in the crate. Cover the crate with an old blanket. This is especially helpful if your puppy's crate is anywhere where he can see you or one of your family members. Think of the phrase "out of sight, out of mind." If he sees someone, he may start whining again for attention. Use an old blanket in case he succeeds in pulling a piece of the blanket in the crate and chewing on it. Place the crate in an area of the house where you cannot hear him. As with babies, sometimes you need to let them cry. If you keep getting up and responding to the crying, then the puppy is being successful at gaining your attention. Also, refrain from negative scolding; you will only succeed in scaring your puppy and possibly turning him aggressive. Wake up early to take your puppy outside for a potty break and leg stretch. Once he realizes that every morning you return to him to take him out, he will be reassured that you have not abandoned him to the crate. Stay on a strict routine, and slowly your puppy will adjust.